Italian food has my heart. I could eat some form of it everyday. 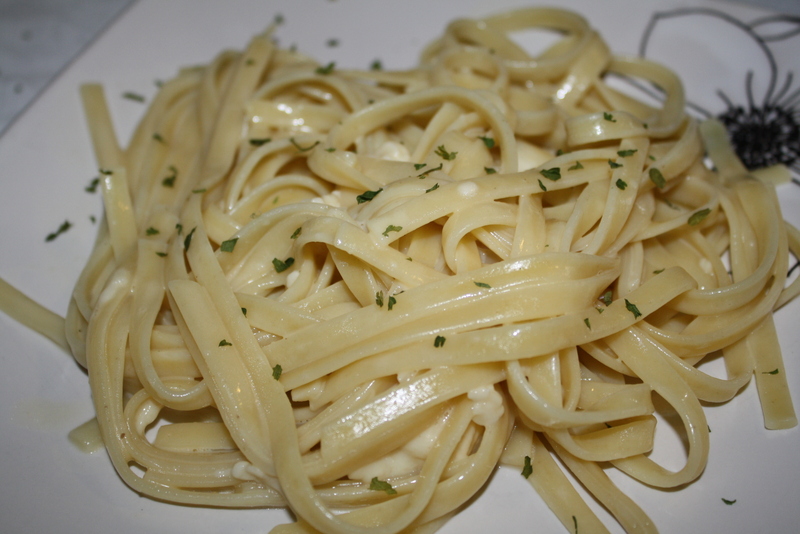 Fettuccine Alfredo is yummy, but I’m more of a tomato sauce type of gal. However, to switch things up, I decided to make this. Zack loves Italian food, too, but he does not prefer noodle dishes. Surprisingly, he liked this one. 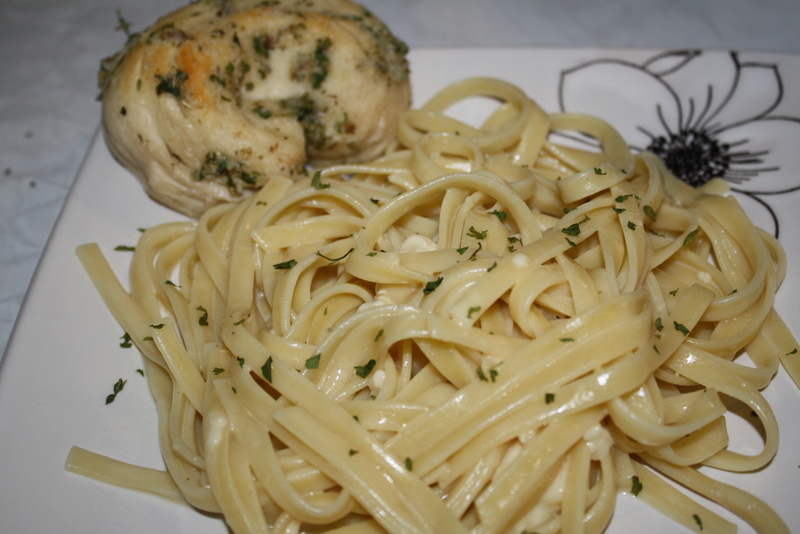 By using evaporated fat free milk instead of whipping cream and reduced-fat Parmesan cheese, you cut the fat of regular Fettuccine Alfredo in half. That sounded perfect to me. I found this recipe in a Betty Crocker cookbook, so I knew it had to be good. I think Betty Crocker is completely fool-proof. When I get on a big baking/cooking spree, my mom calls me Betty. Like I said, this recipe was good, but I think I will stick to tomato sauce Italian dishes for a while. This will definitely be my go-to recipe when I am looking for a change, though. It was really quick and easy. I served it with some really simple Parmesan Knots (as can be seen in the picture below), but I will feature those in a different post. Prep: 10 minutes. Total time: 25 minutes. 6 servings. In a large sauce pot, cook fettuccine as directed on package. While fettuccine is cooking, in a 2-quart saucepan, heat butter and milk over low heat, stirring constantly, until butter is melted. Stir in cheese, salt and pepper. Great healthy twist on a classic! Thanks! I’ll do whatever I can to be healthy but still eat my favs! Looks delish!!! Can’t wait for the garlic knots recipe. Thanks! I hope you got to check out the garlic knots recipe. Using evaporated fat free milk is a great idea! I will try this. Great! Let me know how it turns out. Thanks! Looks good! I like that you lightened it up! I could eat Italian food every day too! Thank you! I have such an Italian heart. Great recipe! I love comfort foods lightened up. Sounds lovely! Thank you! I do too, I am very drawn to anything that even hints at being healthy. I joined! Thank you for telling me about it. This looks delicious! I tried to make a low-fat version and I promise you it was NOTHING like this one……it was also un-eaten! Oh no! You should try this version. It was yummy! Love the idea of FF evaporated milk & thank you for noting that you used shredded parmesan- I didn’t know to use it the first time I made alfredo…and let me tell you, the grated stuff adds a not-so-welcome grainy texture to the dish!